Attention: automatic translation made by Google is very bumpy! Most - Bombers attacked on Christmas Day. In addition to the pilots died and the wife of farmer from a village near Bridge. War raged and air offensive against the Allies fuel production plants peaked. Christmas holidays are officially declared peace. Not always it is not the rule, especially when war is raging. 70 years ago about it in December 1944 firsthand able to convince the denizens Most area. Air offensive against the Allies fuel production plants peaked. The whole area around the bridge and a chemical plant in Zaluzi experienced at the very end of the year three times bombing. All three raids carried out by the Americans, from their bases in southern Italy. The first raid at the end of 1944 came on 16 December. Although the refinery was hit, but not so significantly that consideration be given to the end of production. U Perštejna in the Chomutov crashed American fighter P 51 Mustang, the ruins of which killed pilot FG Wilson. The second action of the Allied Air Force was not long in coming. Bombers over MOSTECKÁ already appeared on December 20 and chemically again suffered damage. Most recently in 1944, Allied aircraft bombed a chemical plant in Zaluzi on Christmas Day, December 25. The raid was the thirteenth in the order. In addition Zaluzi US airlines unions should also aim to Wels and Innsbruck. Due to inclement weather over the Alps, however, part of the union returned and bombed marshalling station in Mestre, Italy. Above Mostecko and arrived just twenty-six machines, which dropped its deadly cargo on goal. 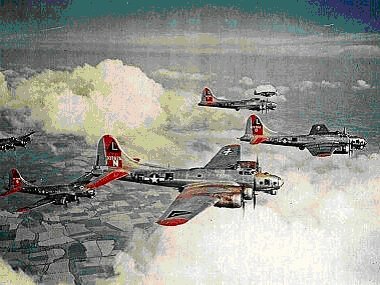 From the beginning, a group of American bombers under heavy fire from German antiaircraft flak. One of the machines, Boeing B-17 Flying Fortress from 463. Bomb Group, cashed in on December 25 over MOSTECKÁ hit and crashed into the area between the villages Jezerí and Drínov. The Flyers tried to runaway machine, piloted by Claude Rains, a native of Texas, leave on parachutes. "One suspect parachute did not open, or after a prolonged fall. When the machine nearly got from my angle of view for a smoke screen over the target, I saw the flames, as if exploded even before he hit the ground, "he said in his testimony Sgt Sam Foster, shooter from neighboring bomber that the tragedy of his colleagues watched. Five pilots survived the crash, four died. One of those who did not survive the kill, the shooter Sgt George A. Roggenbuck, whose chain of wrist found in the 90s of the last century one of mushroom pickers in the woods. Roggenbuck probably killed by the explosion. The crew of the downed bomber pilot 1st / Lt Claude L. Rains, Co / Pilot 1st / Lt Henry F. Renard, Navigator 2nd / Lt Harvey L. Eustrom, Bombardier 1st / Lt Ernest F. Scanlon, Engineer T / Sgt Earl C. Welborn, Radio / Operator T / Sgt Zelah G. McBride jr. KIA, Low Waist Gunner S / Sgt Walter R. West KIA, Bail Turret Gunner S / Sgt David R. McCleary KIA, Tail Gunner S / Sgt George A. Roggenbuck KIA. "They showed us his jumpsuit. Was riddled by shrapnel throughout, but we did not believe them, "testified several years copilot of the airplane Henry F. Renard, who saved a parachute. Near the blast furnace was captured and being deported to a prison camp he was imprisoned in the castle lake. Death in ruins Flying Fortress still found radio operator T / Sgt Zelah G. McBride jr. And gunners S / Sgt Walter R. West with S / Sgt David R. McClearym. The remains of airmen who died were stored on Drínovská cemetery, where after the war were exhumed and taken to a cemetery or allied to the US. Also, the last US air strike in 1944 necessitated casualties. Eight survived the bombing of British prisoners. He died a Dutch prisoner Theodorus Versluis from the camp 17/18. The bombs did not affect only chemical, but also the surroundings. They fell into Želenice example, where an explosion killed one of them, thirty-seven landowners wife Mary Spor, who refused to hide before the raid. Was severely injured miner Keller. To what extent interference suffered shaft Himmlefürst Prince of Heaven, near Genoa. At the very Zaluzi were on the street in the direction of Litvinov totally destroyed four houses, five were moderately damaged and one lightly. At Genoa reported ten lightly damaged houses. With the December events plant suffered more damage, but the greatest damage to production facilities was yet to come. It happened the night of 16 January 1945 when the factory was severely damaged by bombing the British RAF Bomber so that production stopped completely. Chemical plant in Zaluzi found myself for the first time in the viewfinder Allied bombers May 12, 1944, when experienced the first big raid. The event was included in the strategic bombing of the Battle of fuel. Allies and air offensive disrupted the production of fuel for the German war machine, which was so severely paralyzed and disposal of chemical refineries from operating hastened the end of the war. Most area experienced during 17 raids.